On only our second day of the City Newspaper/Interactive course, after a morning’s workshop with eminent journalists and editors Paul Bolding andMaurice Chittenden, we were treated to a discussion session with the executive editor of The Telegraph Media Group, Mark Skipworth. Intimidating title aside, Skipworth struck an amiable figure. Stood in the far left corner of the room in a dark blazer and striped shirt, with a notable absence of Powerpoint presentation and lecture notes, occasionally sipping his carton of coffee or unassumingly shifting the chair in front of him, he spoke frankly and earnestly on his views on the changing industry and how to break into it. He told of publications’ collective angst over when to “flick the switch” from predominantly print to online content, and noted that whereas previously correspondents felt that writing pieces for print was higher up the pecking order than writing for online, this notion has faded. Online content most certainly has advantages over print, from greater engagement with readers to the speed of rolling news online, and from SEO and story promotion to the lack of space restrictions for copy length. Skipworth bemoaned, however, that online content loses the “serendipity of print”, the purchasing of a newspaper as a whole and turning each page with surprise and delight. I must admit my elation at the opportunity of being face to face with a national newspaper editor to ask the question I’ve always wanted to ask a national newspaper editor: What’s the future of your paper and of journalism when you charge for print content but give away online content for free? Skipworth’s answer revealed a far less nihilistic future of print than I’d always imagined it to be. 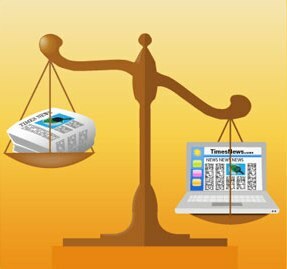 The Telegraph’s tablet and smartphone app subscribers – 350k, and counting – reveal a trend that readers actually want an online version of a printed newspaper instead of merely a website,but Skipworth does admit that it’s not as cut-and-dry as Tablet Triumphs Website: “The website is the thornier issue…[But] I’m not sure if a pay wall in the long run [will work].” What does work, however, is advertising, and with Telegraph.co.uk drawing in around 50 million unique website hits per month, of which two thirds are international readers, advertising on the site will remain lucrative. The journalism industry is certainly undergoing a radical change, causing disquiet among established hacks as well as amateurs, but Skipworth was encouraging in his advice for adapting online and technological skills. Yes, the industry “are looking for digitally-savvy, creative people”, and yes, social media and video/audio skills are lauded, but people make different contributions to different areas of digital media, so it’s best to go with what you personally feel comfortable with, whether you’re a blogger or a tweeter. One message resonated loudest and clearest throughout the print vs. online debate: good journalism should never be compromised on, regardless of the form it takes: “[The Telegraph] has to dedicate time and resources to quality journalism. That has not changed. If we were not involved in quality journalism we would be out of business.” Conventional ways of moving up in the media industry may have disappeared, but no matter how forwards, backwards or sideways it moves, without good quality journalism, “both you and the industry will fall down”.